I heard a lot about the Ajanta & Ellora caves from my childhood days; so when I planned for a trip to see these caves, I thought of covering the other prominent caves near Mumbai and explore all of them in a go. I started my trip from Mumbai. I booked a self drive car from Navigers for my road journey. On the first day, drove from Mumbai to Ajanta (440 kms). We had taken Mumabi - Nashik - Shirdi - Aurangabad - Ajanta bypass roads. 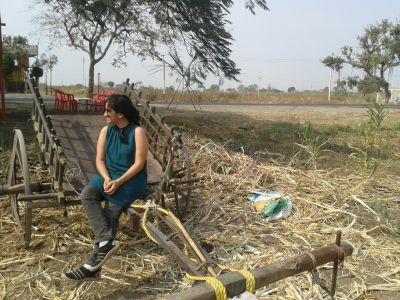 There were lot of onion, cotton and sugar cane fields by the road side. 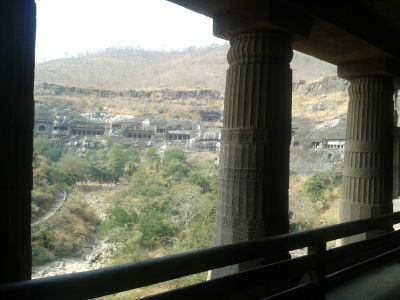 The hotel guy at Ajanta, explained that the "View Point" at Ajanta is mesmerizing; and he suggested to go to 'Ajanta View point' first and then trek down from the wild trail to the 30 rock cut Ajanta caves. Following the local expertise suggestion, next day, we drove to the 'Ajanta view point' early in the morning. The sight was really out of the world. It seemed to be a exotic setting, perfectly formed to carve out the amazing caves. It is believed that the Buddhist monks who carved out these caves, wanted to stay in solitary - and didnt want anyone to find their meditation site. On the first sight, you will find this place to be like a crater; and you cannot see these caves from anywhere else; apart from the view point. 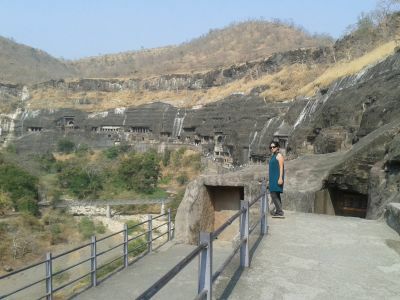 The Ajanta Caves is a complex of around 29 rock-cut Buddhist cave monuments which date back to 2nd century. These caves were discovered in 1819, by a British officer named John Smith, who was out in the forests for hunting. I was trying to imagine that what he must have felt when he saw these abandoned massive caves for the first time. Each cave in Ajanta, has a unique story to tell. And you experience the stories of Buddha coming to life in these caves. The main attraction of Ajanta caves, is the wall paintings. 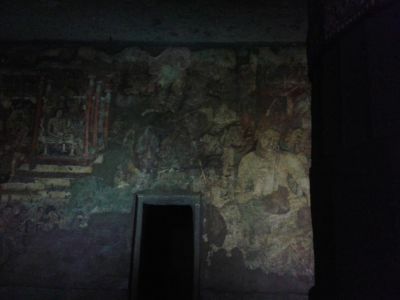 Though these expressive wall paintings are in very ruined state now; it makes you wonder, that what technology might the people have used to draw these fine paintings almost twenty centuries back. 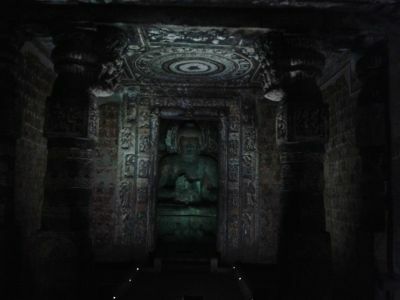 Ajanta caves is currently a UNESCO protected site. You will not be allowed to use cameras with flash-lights inside the caves; so that the cave paintings can be protected for some more years. You will not be allowed to drive your vehicle close to the cave complex also; the vehicles needs to be parked 4 kms away from the caves; and from there you will have to board the government bus that will drop you close to the cave entrance. Ajanta caves is one of the fine historic marvel and I am gald I could explore them; before it perishes completely. After exploring Ajanta, we drove towards Ellora caves, which is at the distance of 90 kms. I spent my night at Hotel Kailash, which offers a magnificent view of Ellora cave complex. The Ellora cave entrance was at a walking distance from my hotel; so I decided to explore these caves early in the morning; so that I could avoid the crowd. I directly entered Cave 16, that is the 'Kailash Temple'. I had read that this was one of the most beautiful carved temple in the world. 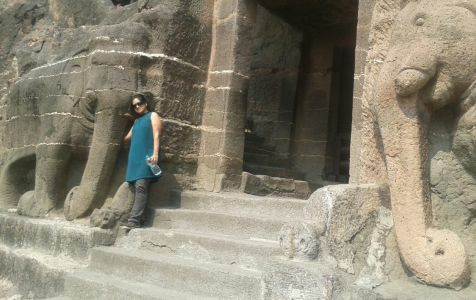 I was amazed to see this massive carved temple with huge sculptures all by myself. There were no tourists when I entered this temple and I was literally scared to enter the main dark sanctum of this huge temple where the Shiv ling was present. Kailash Temple is an marvellous structure, it is one of the largest monolithic structures in the world. This place seemed extraordinarily beautiful with the soft sun rays on the beautiful rock carvings; and no crowd to disturb. Unlike Ajanta - Ellora cave complex had a mix of artworks from Buddhism, Hinduism and Jainism. It was suprising to see 2 storeyed caves here. Caves 13 to 29 - were the most beautiful ones. These consists of the Hindu monuments with elaborate sculptures, wall inscriptions, rock carvings. There is bus facility inside the cave complex, as the last Jain caves are situated at a distance of 1.5 kms from entrance. 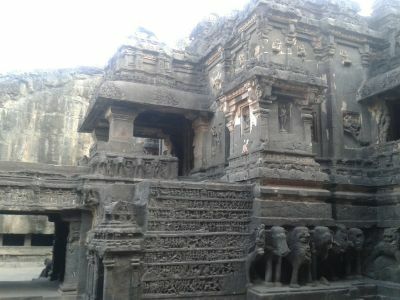 Ellora was more commercialized than Ajanta caves, as the place also contains Grishneshwar temple (the 12th Jyotirlinga). There were lot of pilgrims who had come to visit this sacred temple; and the same pilgrims were also at the Ellora cave complex, adding to the crowd. I also paid a visit to the huge Shiv ling present in the finely carved Grishneshwar temple. This temple was under high security; I had to cross many security check points to enter the main temple sanctum. Even mobile phones were not allowed to be carried inside the temple premises. My next destination was Lonavala, which was at a distance of 308 kms. Bibi ka Maqbara of Aurangabad is the prime attraction of the city and it resembles the Taj Mahal of Agra. 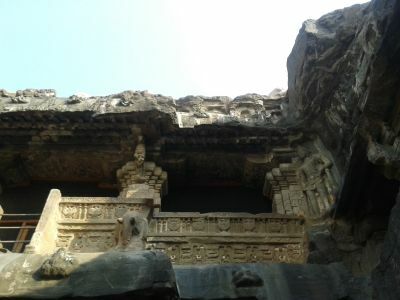 The Aurangabad Caves were Buddhist cave complex, resembling that of Ajanta. The drive to Lonavala was little confusing; there are very less sign boards across Maharastra. Lonavala didnt turn out to be as per my expectation. Though I was there in February, the temperature was too high and the place was dry with no greenery and nothing to remind that it is a ' hill station '. There are many forts near Lonavala and Khandala, but none of the forts are maintained well. It was saddening to see the massive forts built by ancient kings in ruined state. When the forts were built, I m sure that the kings had very limited resources compared to now; but now even with all the advanced technology, the government is not even willing to maintain these historical structure. None of the forts had good roads to reach to them. I really felt pity on the state of these neglected monuments. Rajmachi Fort is said to be the most beautiful fort; which offers magnificent views. Tilkona fort was a triangular fort on top of the hill. Lohagad Fort was massive. There were lot of monkeys till the top of the fort; so had to walk empty handed, so that nothing attracts their attention. 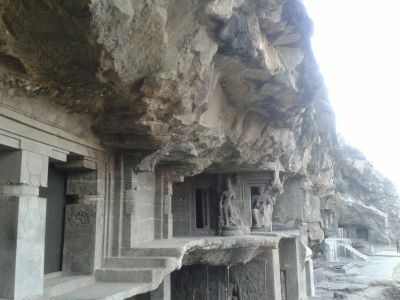 Bhaja / Bhaje caves are located near Lohagad Fort. It was a cave complex with 22 rock-cut caves dating back to the 2nd century. The unique carving here was that of a woman playing tabla. Pawna lake and dam at Lonavala was worth a visit; but the Bhushi dam had nothing much to offer. Lonavala was filled with chikki shops and resorts. The place was totally commercialized and was crowded. At Khandala ghats, I stopped by to see many view points that offer beautiful views of the surrounding hills and valleys. Rajmachi point, shooting point and Duke’s Nose were the best of them. 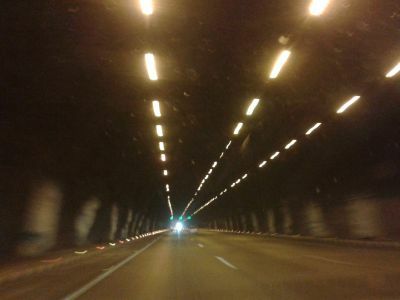 There were many tunnels on the highway between Lonavala and Mumbai. My trip ended back at Mumbai/Bombay - the Bollywood city. The city was a mix of skyscrapers with well connected flyovers and overcrowded slum area - both class of people living closeby. 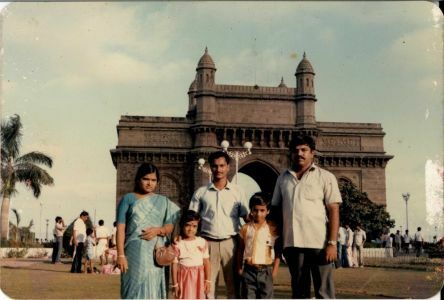 I had found this photo of my childhood in one of my old family album; and I wanted to click a similar photo in front of Gateway of India during this trip. But guess what, I could not go close to 'Gateway of India'. Gateway of India, is now surrounded by barricades after the infamous 26/11 terror attack and over that there were almost a lakh of tourists around that area. I had never seen so many people gathered together at a given point of time in my entire life. It was frightening to face the over population of our country. I dropped my idea to go to Elephanta Caves, after this; as we need to board the ferry from Gateway of India to reach Elephanta. 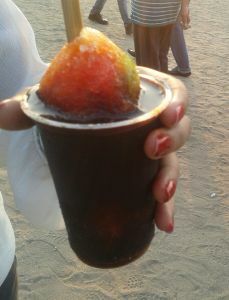 The famous streets of Mumbai had everything to offer from ice gola, vada paav, paav bhaji, paan, sandwich, kulfi, fruit punch etc etc, and everything was delicious. I spent time watching sunset at Chowpatty beach, walking through Marine Drive to Nariman Point, shopping at colaba market.